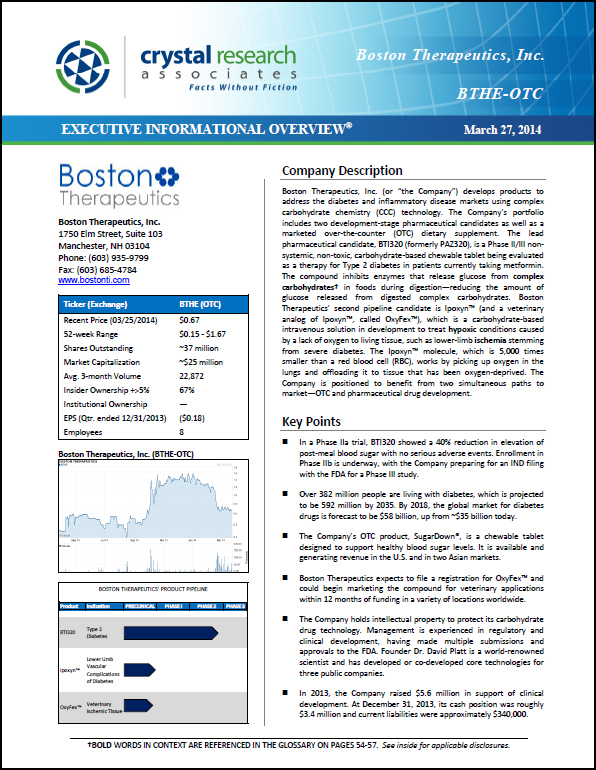 Boston Therapeutics, Inc. (“the Company”) addresses the diabetes and inflammatory disease markets using complex carbohydrate chemistry (CCC) technology. The Company’s portfolio includes two development-stage pharmaceutical candidates as well as a marketed over-the-counter (OTC) dietary supplement. The OTC product, SugarDown®, is a chewable tablet designed to support healthy blood sugar levels. It is available and generating revenue in the U.S. and overseas markets. The lead pharmaceutical candidate, BTI-320, is a Phase II, non-systemic, non-toxic, carbohydrate-based tablet being evaluated as a therapy for Type 2 diabetes in patients currently taking metformin. The compound inhibits enzymes that release glucose from complex carbohydrates in foods during digestion—reducing the amount of glucose released from digested complex carbohydrates. Boston Therapeutics’ second pipeline candidate (currently in preclinical development) is Ipoxyn (and a veterinary analog of Ipoxyn, called OxyFex), which is a carbohydrate-based intravenous solution in development to treat hypoxic conditions caused by a lack of oxygen to living tissue, such as lower-limb ischemia stemming from severe diabetes. The Ipoxyn molecule, which is 5,000 times smaller than a red blood cell (RBC), works by picking up oxygen in the lungs and offloading it to tissue that has been oxygen-deprived. 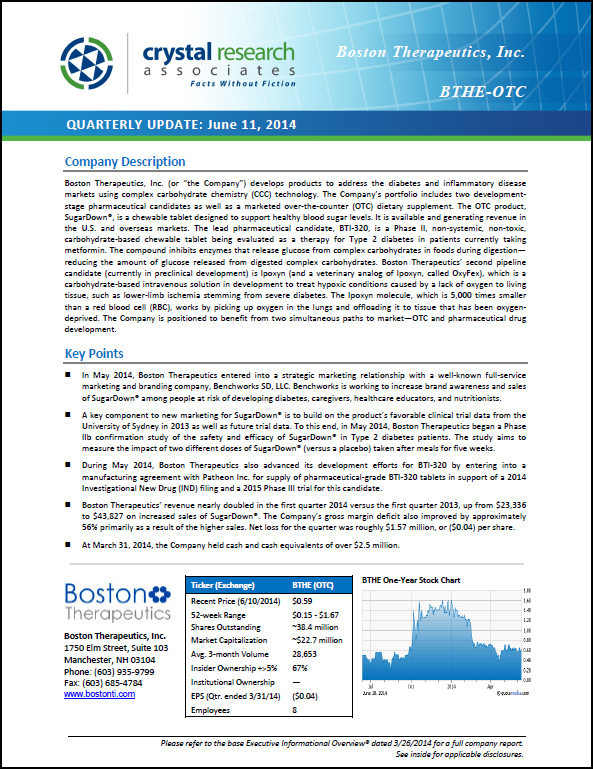 The Company is positioned to benefit from two simultaneous paths to market—OTC and pharmaceutical drug development. 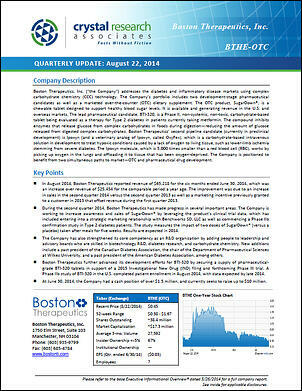 * The Corporate Snapshot was last updated on August 22, 2014.